This is one of those great setups that’s best viewed larger, click here to see the full sized image. 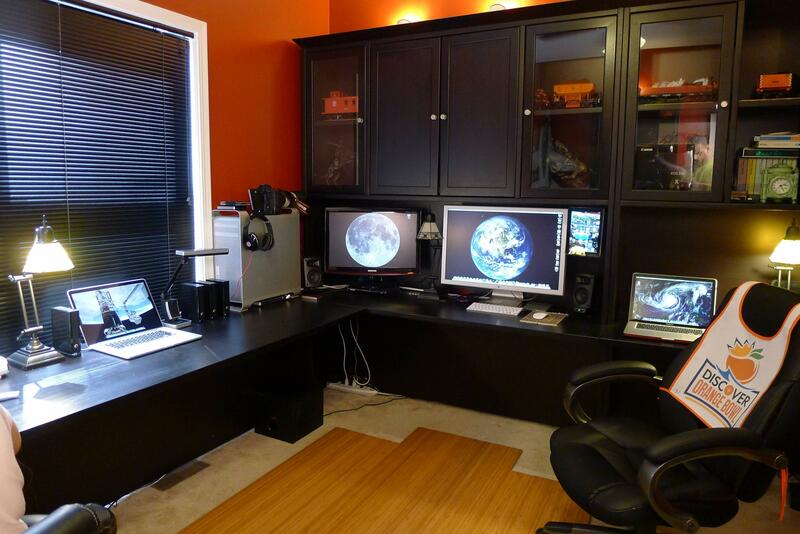 Holy cow that’s a nice desk, and very smart to rest the pergo atop carpet. Loving the Orange Bowl bib too, so excited the season is here again! Love the Desk!! Great setup!! If your computers MAKE you money, how are they a waste of money? Clearly not that good his photography yet as you can see his reflection! Clearly you’re a douche-bag too. Love the desk!! Love the chair!! Anyone know the manufacturer of the chair?? Anyone know what he uses to hang his headphones in the side of the Mac Pro like that? – he should have a better (wide gammut) display, Cinema Display is not. – using unergonomic Apples Mice/Trackpad isn’t very professional. – and if he really has this kind of wallpaper in use, it’s disastrous. You need a lighter, more even wallpaper near 18% grey tone. So, it may be a astonishing hardware setup, but that’s not all. Maybe you should be an interior designer, twinkle-toes. Who are you to say what color the wallpaper and ergonomic equipment should be for someone you’ve never even meant you jerk. Apples Mice/Trackpad is fine in a pro-setup or pro-environment, what are you talking about? 30″ Cinema Display is fantastic, a bit slow, but fantastic, I’ll take it over a glossy, reflective screen wide gamut dodo. Hahahaha… Beats by Dre. This man is funny. A very cool and inspiring office/sanctuary!! Thanks for sharing…. Looks very, very comfortable. Not pretentious. Love the headphones! Ive thought of creating a RAID of several top capacity terrabyte drives in a Mac Pro. I wonder though, what each computer is specifically for? I’m a minimalist, I can’t have a laptop in addition to my desktop, I do all my work in studio. But thats me. Unless I have to do remote work then I’ll get a laptop. Well, in addition to wanting to know who that is in the reflection I’d like to know who that is sitting in the chair at left. What kind of lamp is that sitting next to the three Seagate GoFlex drives. Nice setup. But for a photographer you would not expect the person to show himself in the glass of the cupboard door. Anyway. How did you RAID the Seagate GoFlex USB drives.